Scrapwalls is a really fun way to cherish all those photos that are just sitting around on your computer, waiting to be seen and remembered. Their website is user friendly, so easy my kids could do it. You can choose from one of their over 28 templates then upload your photos, customize the layout and once you are done order a high quality poster of your collage. I adore my collage creation! Fast. Easy. FUN. This is a Michigan based company, right from my very own mitten state home! I love how it turned out, it's really fun for the kids to admire. Mine stand there for several minutes trying to pick out different photos of themselves, it's so cute. I had originally gotten my poster framed and matted by another company that I will not mention. They did a terrible job and when I tried to get them to redo it they messed it up again so I grabbed my poster, got my refund and here it is. I'll have to do it myself sometime! When I ordered I really had a hard time deciding on the template, there are so many and all so fun! Just look at this one, I was so tempted to do this one and just choose photos of my husband and I when we went on our Baja cruise a few years ago...I just might need to order this one in the future! 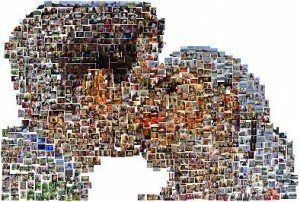 Can you imagine doing one of these with all your wedding photos, or perhaps engagement photos? I know it would be something that guests in your home would stop to admire, they would probably ask where they can get one themselves! Not only can you make large collages, you can create greeting cards. Here is an example of something that I created. It just worked out perfectly that I had a photo of the star on our tree from last year, that became the top. You can upload however many photos you wish, if you want only 1 then just do one! You can play around by clicking on each photo to move it to wherever you want, I like that option. Scrapwalls is so much fun and what a nice card to be able to send, so personal. You can just go play around on their website, no need to log in unless you decide to purchase. Be sure to "like" their Facebook page for the chance to win one of their weekly drawings for a free $30 credit! They also give away big coupon codes sometimes! Disclaimer: I was not compensated in any way for this post. However, I did agree to write a review in exchange for a complimentary photo collage. I paid for my own shipping. Receiving this for free in no way influenced me to write a positive review. Special thanks to Scrapwalls.com for letting me try this out and share with my readers.